Automated ac measurement with precision that is easy to use The 5790A AC Measurement Standard is a complete automated ac measurement standard designed for the most demanding calibration applications. It combines the accuracy you would expect from a thermal transfer standard with the ease-of-use of a digital multimeter. Absolute ac voltage measurement uncertainties are as low as ±24 ppm (one year, 23°C ±5°C). 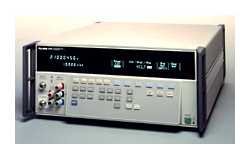 The 5790A is designed to meet the complete ac voltage and wideband verification requirements of the 5700A, 5500A and other calibrators, amplifiers like the 5725A and 5205A/5215A, and transfer standards and ac voltmeters. The 5790A covers an alternating voltage range of 700 µV to 1000V, and a frequency range of 10 Hz to 1 MHz. A wideband voltage option extends frequency range to 30 MHz to meet the calibration requirements of Fluke 5700A, 5720A and 5100 Series Wideband Options.. The 5790A is also compatible with A40 and A40A Current Shunts, which permit you to make ac/dc current transfer measurements up to 20A..